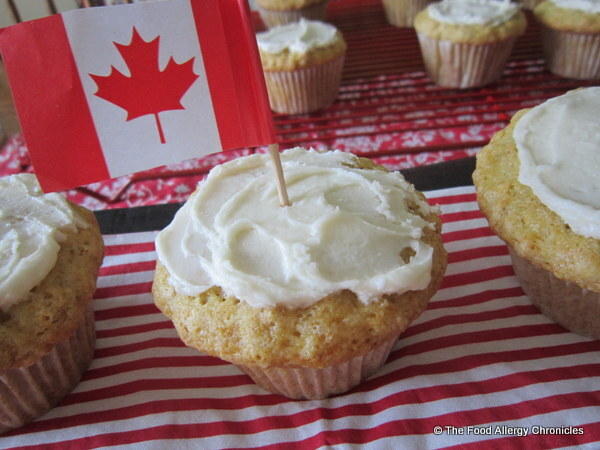 Posted on July 1, 2013 by Susan H.
Dairy, Egg, Soy and Peanut/Tree Nut Free Maple Syrup Muffins are perfect to celebrate Canada’s 146th birthday! 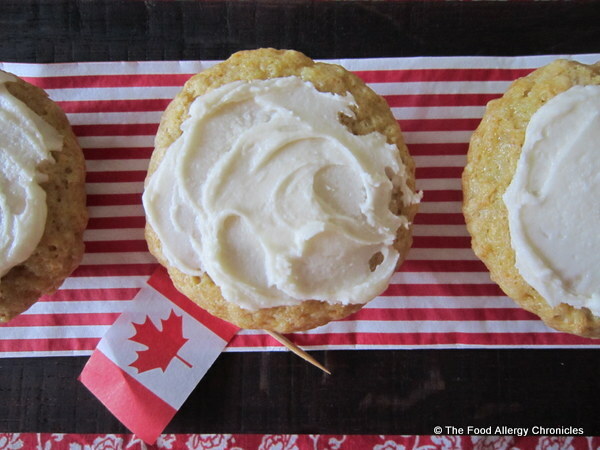 What better way to celebrate Canada Day than with some maple syrup laced muffins! These were the perfect treat to bring over to my neighbour/friend Leslie’s where my boys were having a fun afternoon swimming with their friends in their pool. Not quite sure where I acquired and wrote this recipe down from…I have had it since before I was married…enjoy! Add the wet to the dry and stir just to combine. Fill 12 paper lined muffin tin with batter. Bake at 350 F for 20- 25 minutes or until golden. Let cool for 10 minutes in the muffin tin before removing them to finish cooling on a cooling rack. How will you be spending Canada Day? Baking anything special to celebrate? Do share! This entry was posted in allergies, baking, breakfast, Canada Day, dairy free, egg free, muffins, multiple food allergies, oats, peanut/tree nut free, Snacks, soy free, Uncategorized and tagged Celebrating Canada Day with allergy friendly maple syrup muffins, Dairy Egg Soy and Peanut/Tree Nut Free Maple Syrup Muffins, Earth Balance Soy Free Buttery Spread, Earth Balance Vegan Buttery Sticks, Natur-a Rice Beverage by Susan H.. Bookmark the permalink. Mmm… any muffins that taste like maple syrup are A+ in my books! 🙂 My day was rough, but I won’t go into it… tomorrow is a new day!